So last night while I was waiting for the woman at the Home Depot to get me some ice (I dropped a box of tiles on my finger. It's a little stiff, but ok.) I distracted myself by looking at books on a nearby rack. Among the various things I saw on the rack was this cookbook. 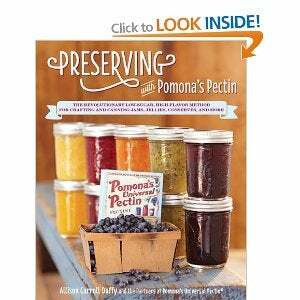 I used Pomona Pectin to make charred chill-tomato jam last year, so this caught my eye. Most pectin that you get for jam making requires a certain amount of sugar in order for it to jell. Pomona Pectin uses a different chemical reaction all together so you can use whatever sweetener you want. Both my Dad and my FiL are diabetic, so this should be useful. I've yet to make anything with it, but once I do, I'll share results. I know other people in the GT also do canning, so I thought I would share this.